Asteroid 2012 DA14 is making headlines this week, despite the fact that the "incoming" space rock, as it has been described, definitely won't hit Earth. The 150-foot-wide space rock will pass within 17,000 miles (27,000 kilometers) of us next February. That's nearer than the orbits of some geosynchronous satellites, and the closest shave of a mid-size asteroid ever predicted before the actual flyby has occurred. 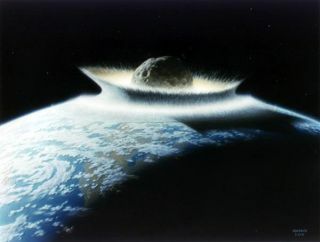 But even so, NASA assures the world that there is no chance of asteroid 2012 DA14 hitting Earth next year. Zero, zip, zilch. Why, then, all the terror about this unthreatening space rock? And why the recent doom and gloom about another space rock, the big asteroid 2011 AG5, a football-field-size rock that NASA says will almost certainly not collide with the planet in 2040? Don Yeomans, head of the Near-Earth Object Observations Program at NASA's Jet Propulsion Laboratory, blames the upsurge in asteroid panic on two main factors. "One problem is that the Internet is wide open to anyone to say anything," Yeomans told Life's Little Mysteries, a sister site to SPACE.com. In the past, claims about asteroids were written up by scientists and submitted to peer-reviewed journals, a critical process that "would filter out nonsense," he said. "If something was published, it was reliable." But today, hundreds of scary blurbs about the latest asteroid get written and posted to blogs and tabloid-like sites before NASA scientists can vet the claim and publish their official, less-terrifying statement regarding the asteroid's trajectory. The other half of the problem is that many people do not know how to judge the validity of the pseudo-scientific information they read. "There are millions of people out there who have not been trained in the scientific method, and don't understand that evidence is critical for supporting any new idea — especially any dramatic departure from the current state," he said. In psychology, this is known as the Dunning-Kruger effect. People who lack knowledge in a given area, such as science, are unable to accurately assess their own abilities in that area, and so they aren't aware that they are coming to blatantly false conclusions. David Dunning, a psychologist at Cornell University who first characterized the phenomenon, recently explained, "Many people don't have training in science, and so they may very well misunderstand the science. But because they don't have the knowledge to evaluate it, they don't realize how off their evaluations might be." There is no obvious remedy for the one-two punch of widespread misinformation and a lack of mental tools for evaluating it, but Yeomans said scientists need to do a better job engaging with the public. He and his group regularly address people's fears regarding near-Earth asteroids by making statements and issuing news releases. "The hope is that people will understand that we are the more trusted sources of information," Yeomans said. In this oblique view, the path of near-Earth asteroid 2012 DA14 is seen passing close to Earth on Feb. 15, 2013. And in the case of 2012 DA14, the information is this: There is zero chance of the asteroid hitting Earth next year. The chance of a collision is slightly higher — 1 in 80,000 — when it swings past in 2020, but radar and optical observations of the space rock during next year's flyby will help the scientists nail down its trajectory, which will in all likelihood reduce the 2020 risk estimate to zero. There are better things to worry about even than the absolute worst-case scenario. If observations next year show that current estimates are way off and the asteroid and Earth are on track to collide in 2020, then NASA would try to deflect it by bumping it with a space probe sometime before then — a move Yeomans says is doable. Even if that failed, any Earthbound asteroid has a 70 percent chance of plunging into the ocean, and a much higher chance still of impacting only an ocean or an unoccupied land region. An asteroid this size strikes Earth every 700 years or so, Yeomans said. Humanity has survived innumerable such events. This story was provided by Life's Little Mysteries, a sister site to SPACE.com. Follow Natalie Wolchover on Twitter @nattyover and Life's Little Mysteries on Twitter @llmysteries, then join us on Facebook.